Channel NewsAsia are doing a three part special on the F-35 and potential acquisition of the F-35 by Singapore. Long articlescovering general basic program and capability so click the links to read if you are interested. Last story is expected in a couple of days. The third installment has just been published. Good to see RAAF F-35 numbers increasing in addition to now operating jets within their own ALIS installation. The milestone aircraft, serial A35-010, is the second to be delivered direct to the RAAF’s 3SQN, which is operating alongside US Air Force F-35A training units at Luke. The RAAF’s other eight aircraft have to date operated under the USAF’s and Lockheed Martin’s training and maintenance systems, whereas aircraft nine and 10 were delivered under the RAAF’s own airworthiness authority and Autonomic Logistics Information System (ALIS) maintenance system. “Our tenth JSF was delivered to RAAF’s 3SQN at Luke AFB last week following a range of acceptance testing activities authorising delivery,” Defence Minister Christopher Pyne said on Monday. Two RAAF F-35As are due to ferry to Australia in early to mid-December, after which they will conduct an Australian-specific verification and validation (V&V) period in preparation for 3SQN returning to Australia in 2019. A further eight F-35As are due to be delivered to the RAAF in 2019, while another 15 “should be under contract by early 2019 for delivery in 2020”, according to Defence. To date, eight RAAF pilots are qualified on the F-35A and are instructing at Luke, while 27 maintainers have completed training on the type. Initial operational capability (IOC) is planned for December 2020. The MDFs are one of the significant advantages the F-35 has over other fighter aircraft, by combining fusion of data with advanced sensors and known parameters. The article also has some general software and Blk 4 info. Some interesting comments from the US Army Chief of Staff on the F-35 and CAS. Without doubt the A-10 provides great CAS in low threat environments but I see these comments as an indication that the US Army doesn’t think those low threat CAS environments will persist, or at least be as common as they have been the last twenty years. The article also talks about the continuation of the A-10/F-35 CAS support trials and it will again be interesting to see how the respective platforms perform although there may never be a public release of the results. Finally, given where the USMC is already taking the F-35 capability by linking it to indirect fire assets and within the C4 structures I think the US Army have taken note and will hopefully look to build on the symmetry provided by all three fixed wing services operating the same CAS aircraft. The US Army wants the F-35 to support its ground troops. It’s that simple. We hear volumes of information about the Marine Corps vertical-take-off-and-landing F-35B, Navy carrier-launched F-35C and Air Force F-35A - but what does the Army think of the emerging Joint Strike Fighter? Does the Army think the 5th-Gen stealth fighter would bring substantial value to targeting and attacking enemy ground forces in close proximity to advancing infantry? What kind of Close Air Support could it bring to high-risk, high-casualty ground war? “When you are in a firefight, the first thing infantry wants to do it get on that radio to adjust fire for mortars and locate targets with close air support with planes or helicopters. You want fires. The F-35 has increased survivability and it will play a decisive role in the support of ground combat,” Army Chief of Staff Gen. Mark Milley told reporters at the Association of the United States Army Annual Symposium. Gen. Milley’s comments are quite significant, given the historic value of close air support when it comes to ground war. His remarks also bear great relevance regarding the ongoing Pentagon evaluation assessing the F-35 and A-10 Warthog in close air support scenarios. Over the years, close-air-support to Army ground war has of course often made the difference between life and death - victory or defeat. The Army, Milley said, wants next-generation close-air-support for potential future warfare. “We fight with the Navy, Marines and Air Force. Our soldiers have never heard an Air Force pilot say ‘I can’t fly into that low-altitude area,’ These guys take incredible risk. If there are troops on the ground, they are rolling in hot,” Milley said. While Milley of course did not specifically compare the A-10 to the F-35 or say the Army prefers one aircraft over another, he did say the F-35 would be of great value in a high-stakes, force-on-force ground war. Long-revered by ground troops as a “flying-tank,” the combat proven A-10 has been indispensable to ground-war victory. Its titanium hull, 30mm cannon, durability, built-in redundancy and weapons range has enabled the aircraft to sustain large amounts of small arms fire and combat damage - and keep flying. At the same time, as newer threats emerge and the high-tech F-35 matures into combat, many US military weapons developers and combatant commanders believe the JSF can bring an improved, new-generation of CAS support to ground troops. Thus - the ongoing Office of the Secretary of Defense comparison. Accordingly, the Pentagon-led F-35/A-10 assessment is nearing its next phase of evaluation, following an initial “first wave” of tests in July of this year, Vice Adm. Mat Winter, Program Executive Officer, F-35 program, recently told a group of reporters. “Mission performance is under evaluation,” Winter said. Upon initial examination, some might regard a stealthy, 5th-Gen F-35 as ill-equipped or at least not-suited for close air support. However, a closer look does seem to uncover a handful of advantages - speaking to the point Milley mentioned about survivability. Long-range, computer-enabled F-35 sensors could enable the aircraft to see and destroy enemy ground targets with precision from much higher altitudes and much farther ranges than an A-10 could; the speed of an F-35, when compared to an A-10, would potentially make it better able to maneuver, elude enemy fire and get into position for attack; like the A-10s 30mm gun, the F-35 has its own 25mm cannon mounted on its left wing which could attack ground forces; given its sensor configuration, with things like a 360-degree Distributed Aperture System with cameras, the F-35 brings a drone-like ISR component to air-ground war. This could help targeting, terrain analysis and much-needed precision attacks as US soldiers fight up close with maneuvering enemy ground forces. An F-35 might be better positioned to respond quickly to enemy force movement; in the event that enemy air threats emerge in a firefight, an F-35 could address them in a way an A-10 could not, obviously; an F-35 would be much better positioned to locate enemy long-range fires points of combat significance and destroy hostile artillery, mortar or long-range-fires launching points. Finally, while the A-10 has a surprising wide envelope of weapons, an F-35 could travel with a wider range of air-ground attack weapons - armed with advanced targeting technology. Also, fighter-jet close air support is by no means unprecedented. F-22s were used against ISIS, F-15s were used against insurgents in Iraq - and the F-35 recently had its combat debut in Afghanistan. There are, however, some unknowns likely to be informing the current analysis. How much small arms fire could an F-35 withstand? Could it draw upon its “hovering” technology to loiter near high-value target areas? To what extent could it keep flying in the event that major components, such as engines or fuselage components, were destroyed in war? How much could A-10 weapons and targeting technology be upgraded? Regardless of the conclusions arrived upon by the ongoing assessment, it is likely both the A-10 and F-35 will perform CAS missions in the immediate years ahead. When it comes to the Army and the F-35, one can clearly envision warfare scenarios wherein Army soldiers could be supported by the Marine Corps F-35B, Navy F-35C or Air Force F-35A. “We don’t fight as an Army - we fight as a joint force. What makes us different is the synergistic effect we get from combining various forces in time and space,” Milley said. Some logical reasons put forward by Loren Thompson on why the USAF should increase their yearly buy of the F-35A. The other side is whether LM could support a larger buy today and the answer is probably not immediately. It would likely take two plus years to reach the output required to service the large foreign replacement cycle that is occurring as well as meet 100+ USAF orders besides the USMC and USN orders. October 26 (Friday) is the anniversary of the day in 2001 when Lockheed Martin was awarded the contract to develop the F-35 fighter. Since then, the program has successfully navigated the path from initial development to serial production. Prices have fallen faster than predicted. Each of the three variants developed for the Air Force, Navy and Marine Corps has met its performance objectives. In exercises, the F-35 defeats adversary aircraft by a ratio of 20-to-1. The plane wins every foreign competition in which it is entered. So the late Senator John McCain apparently was prescient when he predicted in 2012 that F-35 might become "the greatest combat aircraft in the history of the world." After completing over 9,000 flight tests during which there were no serious mishaps, the plane has demonstrated that it is ten times better than legacy fighters at jamming enemy radar, six times better at winning aerial engagements, and five times better at striking ground targets. It also collects and interprets intelligence better than any tactical aircraft in history. I have been a supporter of the F-35 fighter since its inception -- which helps explain why many of the big companies associated with the program contribute to my think tank. Some are also consulting clients. But because I have been following F-35 for so long, I am all too aware of how political distractions and passing fads can undercut the potential of a program that today ranks as one of the most successful development efforts in military history. Nowhere is the challenge of keeping the program on track more apparent than within the Air Force. Air Force leaders understand that F-35 is a game changer. They also realize that because their service is destined to absorb 72% of the domestic production run, the rate at which they buy the plane impacts the price that sister services and allies must pay for it. But the Air Force is a complex institution, with numerous missions and communities. Sometimes the vision of what F-35 was intended to be gets obscured. That is at least one of the reasons why the Air Force has not ramped up production to the rate originally envisioned. There are big dangers associated with moving too slowly on F-35 procurement. Here are the five dangers that should matter most to the Air Force. 1. At current procurement rates, the fighter force will shrink and age. The Secretary of the Air Force has stated that her service needs many more aircraft squadrons than it currently has to do its job. She's right. However, the Air Force requested only 48 F-35As (its version of the fighter) for 2019, and expects to order no more than 54 annually through 2023. As old fighters retire, the service needs at least 66 F-35s per year to preserve its force structure. And if it orders less than 100 each year, the already aged fighter fleet will continue growing older. 2. Much of the current fighter force won't survive in a future war. About 80% of today's fighter force consists of aircraft developed in the 1970s. The planes have all been upgraded, but some things like the integrated stealth that makes F-35 invisible to enemy radar can't be retrofitted. Intelligence estimates indicate non-stealthy aircraft will suffer severe losses in a future East-West war. At current F-35 procurement rates, half the force will still be Cold War fighters in 2030. Doubling the rate to 100 per year would cut the number of sitting ducks to below 20% in 2030. 3. The U.S. Army can't win in Europe without lots of Air Force F-35s. The Army depends on air cover to fight and win. However, Army planners say that Russian air defenses over Eastern Europe are so dense they can no longer count on having overhead protection. Given the advantages Russia would enjoy fighting close to home, the Army would probably be defeated -- unless the Air Force can deploy hundreds of highly survivable F-35s to suppress Russian air defenses and fires. U.S. naval aviation can't get close enough to do the job. 4. Tight budgets will crush weapons spending in the next decade. As I noted earlier this week in Forbes, a combination of rising inflation plus big budget deficits will bring an early end to the Trump defense buildup after 2020. By midway through the next decade, the federal government's cost to carry its accumulated debt will likely exceed a trillion dollars annually. Meanwhile, entitlement outlays for baby boomers will be at a peak. So it is going to get a lot harder to acquire new weapons. The Air Force needs to buy the F-35s it requires now, before budget walls close in. 5. Unlike other game-changing weapons, F-35 is available today. The Air Force doesn't just need new fighters, it needs new tankers, bombers, trainers and radar planes. Everything is worn out. What makes F-35 different from the other new weapons, though, is that it is in production and operational today. All the other planes are still in development. Because high-rate production of all the different aircraft the Air Force needs will be fiscally impossible by the time planes like the bomber complete testing, it is just common sense to speed deliveries of the one game-changer available today. The most amazing thing about the F-35 is that it exists at all. The Clinton administration loaded up the plane with so many missions and requirements that it is nearly a miracle the program managed to reach serial production. Now that it has, though, the military needs to take advantage of the $100 billion that four presidents have invested in getting to this point. If the threat forecasts in the National Defense Strategy are valid, the day is not far off when it will be obvious the Air Force should have been buying the F-35A at twice the rate it currently contemplates. A further grounding for a small number of F-35B aircraft due to additional fuel tubes. Apparently they are only worried about high flight hour F-35Bs because the flight stresses of the jet are different to the A and C models. The A and C will have the fuel tubes replaced as part of regular maintenance. The tubes being replaced also come from the same supplier as the previous issue. The F-35 Joint Program Office temporarily has halted flight operations for a number of F-35s with higher flight hours after finding two new parts that will require inspection on older models of the jets. Some of the older engines with higher flight hours may require additional fuel tube replacements. F-35s that have not reached the “inspection requirements” are continuing normal flight operations, according to the Joint Program Office. A source close to the program said the two additional tubes currently being inspected are made by the same supplier and using the same method as the initial tube that was found to be faulty and resulted in a fleetwide grounding this month. Because the Marine Corps' F-35B short takeoff and vertical landing jets are subject to different stresses than the other models, only B models that have reached a certain number of flight hours will be grounded for inspections. F-35A conventional takeoff and landing aircraft and F-35C carrier takeoff and landing jets, however, will have tubes replaced as part of normal phased maintenance. The Marine Corps air station out of Beaufort, South Carolina, told Marine Corps Times that its F-35Bs are cleared to fly. “We are conducting our inspections of all our aircraft, per the JPO statement,” Lt. Sam Stephenson, a Marine spokesperson for the 2nd Marine Aircraft Wing, said in an emailed statement. There are also F-35Bs embarked with the 13th Marine Expeditionary Unit, or MEU, aboard the Wasp-class amphibious assault ship Essex. The 13th MEU is currently operating in the U.S. Central Command area of operations. Lockheed Martin, the prime contractor for the F-35 air vehicle, referred questions to the JPO and to Pratt & Whitney. On Oct. 11, the Pentagon announced it had temporarily grounded its entire fleet of F-35s due to a suspected issue with a fuel tube. The grounding was driven by findings from the first F-35B crash near Beaufort on Sept. 28. The pilot in that incident safely ejected from the aircraft. Despite some community opposition and scare mongering the F-35s will be based at Vermont with the National Guard and work continues there to prepare the base for the arrival. Some Vermont Air National Guard aircrew are already flying the jet in other locations. Parts of the Vermont Air Guard base in South Burlington are nearly unrecognizable on the inside and out, buildings gutted and in the process of being revamped. "This is an exciting period for us," said Col. David Smith, the commander of the 158th Fighter Wing. -The airfield will be finished in December; it's currently 90 percent complete. -The main maintenance hangar will be finished in May; right now it's 30 percent complete. -The ops building renovations are on track for February; they're currently two-thirds done. -The F-35 flight simulators are also expected for February; that's two months early. The Vermont Air National Guard will get four F-35 simulators in preparation for the arrival of the F-35s. We got a look at one Friday and it is one of the last times we will be allowed in. The Guard says once it's classified, there will be no cameras allowed. The simulators are to help train the 25 pilots the Vermont Guard expects to have trained on the fighter jet. The 158th Fighter Wing is getting 20 planes-- 18 active and two backups. We also learned four Guard pilots are already flying the fighter jet at other locations. "In my discussions with them, they love the airplane," Smith said. "It's flying well, it's extremely capable and they love working on it." Community concerns linger over noise and the safety of the plane, resurfacing after a recent crash in South Carolina that temporarily grounded the entire F-35 fleet. More than 80 percent of those planes have since been returned to duty. Guard officials say that has not affected the timeline for the plane to come here and they dismissed a Government Accountability Office Report that highlighted deficiencies in the plane. "Those deficiencies are-- at least not from a flying safety perspective-- critical," said Lt. Col. Nate Graber, the Vermont Air National Guard F-35 PIO director. It will be 11 months before the F-35 lands here. But the public will not see the plane until then. The Guard says plans to bring one beforehand were scrapped because of logistics. We also asked what would happen to the current fleet of F-16s once the F-35s start arriving. The Guard says the F-16s will be rotated to other Guard bases to replace other planes at those. The transition to the F-35 is expected to take several months after the first planes arrive. Some interesting comments by Loren Thiompson on why not to recompete the EW system on the F-35. I see both sides of the argument, a recompete has done well on reducing the cost of other systems on board while at the same time it appears that BAE have done very well on reducing cost. The F-35 fighter program has produced the most survivable, versatile tactical aircraft in history for use by three U.S. military services and a dozen allies. F-35 is an amazing achievement, but an expensive one. It will cost about $700 billion in today's dollars to keep all 2,443 Air Force, Marine and Navy planes flying through 2070. At least, that is the government's estimate. So now that the cost of building the planes has come down, the search is on for cheaper ways of sustaining and upgrading them. One step that airframe prime contractor Lockheed Martin has undertaken to reduce life-cycle costs is to recompete key subsystems on the plane. For instance, on June 13 Lockheed announced it would shift production of the F-35's distributed aperture system -- six infrared cameras installed around the plane -- from the current incumbent to Raytheon. It said that would save $3 billion in life-cycle costs, mostly in post-production sustainment. Other competitions among subcontractors are being contemplated. One item being eyed for a recompete is the F-35's electronic-warfare system. The system complements a stealthy airframe design by detecting, identifying, locating and countering threats operating on the electromagnetic spectrum -- threats like air-defense radars and heat-seeking missiles. Using the "EW" system, a pilot has continuous 360-degree awareness of such dangers. The information is used to evade, deceive or suppress those dangers through methods such as jamming the signal or dispersing countermeasures (chaff and flares). It's all quite arcane, but the F-35's electronic-warfare system is so capable that it reportedly has been selected for use on the Air Force's next-generation B-21 bomber, a strike aircraft that is designed to penetrate the most densely defended airspace in the world. So we know the system must work pretty darned well. Nonetheless, Lockheed Martin is considering holding a competition to see whether there might be a cheaper, more capable source for the F-35's onboard EW suite. I think this is a bad idea. If the goal is to discipline the incumbent's price and performance, there might be some superficial logic to the exercise -- although the system's price is falling fast and its performance is flawless. If the goal is to seriously seek another source, though, recompetition is a disaster waiting to happen. It could impair progress on the entire F-35 program, and it definitely will not deliver the gains that typically justify a recompete. Before laying out the reasons why I believe a recompete would backfire, I should note that the company making the F-35's electronic-warfare system, BAE Systems, is a consulting client and contributor to my think tank. So is Lockheed Martin. I also have business relations of one sort or another with companies like Raytheon that might offer an alternative to the BAE technology. Having said all that, I think Lockheed will be sorry if it launches a serious recompete of the F-35's EW system. Here are just a few of the reasons why. First, the F-35's EW system is tightly integrated with the rest of the on-board electronic architecture. In the old days, planes like the F-15 fighter had "federated" electronic-warfare systems in which components were not tightly coupled. They could be mixed and matched the way audiophiles used to assemble their home stereo systems. On a fifth-generation fighter like F-35, though, the EW suite relies on the same core processor and radar that other on-board subsystems do. You can't just yank out one EW box and plug in another. Second, BAE Systems has been working on electronic-warfare solutions for F-35 since the program's inception nearly two decades ago. That isn't so surprising because BAE is the most experienced provider of electronic-warfare systems in the world. In fact, it is the only company that has built EW systems for stealthy fifth-gen fighters. Lockheed can't bring alternate sources up to speed by just passing along the relevant specifications and drawings. After two decades, BAE understands the F-35 architecture in a way nobody else will. Third, F-35 has recently completed the most extensive flight-testing regime ever conducted for a new plane. There were over 9,000 flight tests, during which a vast array of combat scenarios were used to assess the functionality of on-board electronic-warfare capabilities. There is no way that experience can be replicated at this late date for a new source -- at least, not if the goal is to save money. The evidence provided by the flight tests is that the EW system currently installed on F-35 works very well. Operational experience bears that out. Fourth, it is wildly implausible that an alternate source could deliver better pricing for its EW system. The cost of the BAE Systems suite is falling by 9% in each successive production lot of the F-35. In fact, it has fallen by over three-quarters since the first fighters were built, which is better price performance than the overall airframe has delivered. The notion that a new provider will show up with better pricing is a fantasy. What it will show up with is a PowerPoint briefing and a bunch of unprovable claims. Fifth, to be viable, a new source would need to match or surpass the production rate that BAE has achieved through continuous investment in sophisticated manufacturing and testing facilities, not to mention skills. The program needs an EW supplier to deliver 150 shipsets of equipment per year within the constraints of a fixed-price production contract. A new provider might be able to turn out 10 or 20 shipsets in its first year of assembly, but 150? At a lower price than the incumbent and with nearly flawless quality? Good luck on that. Sixth, the goal of a recompete isn't to minimize the cost of sustaining a static system. Threats are changing rapidly, and each block upgrade to F-35 will require advances in EW functionality across most of the fighter's missions. It is inevitable that a longtime incumbent will have a better grasp of how to integrate new capabilities into the existing F-35 architecture than any latecomer possibly could. Other sources might have some neat ideas, but they won't have enough knowledge to implement them on a fifth-gen fighter. You could justify taking these chances if the incumbent had failed to satisfy key performance parameters or was not moving down the learning curve in pricing its product. But none of that is the case here. The F-35's EW system is a case study in unsurpassed performance at rapidly falling prices. The notion that a company not previously involved in the program could somehow surpass current levels of performance or pricing without possessing the requisite knowledge base ignores everything we know about how complex technology efforts are successfully executed. Ozair, are you in anyway compensated for your time spent covering the F-35? Should be! Thanks for keeping us up to date. Do you know what is involved with sustainment of an ee system? Ha, no not at all. Based on my previous employment experience I have a big interest in the aircraft (and most fighter jets as posters can probably tell) but that is it. I wasn’t originally a fan when I joined the forum in ~2005 as my posting history could show (not sure if any of that can still be accessed…). I supported Australia seeking to acquire the F-22 and other options but based on what I have read and been involved with since I realise how significant a capability the aircraft is and how well it fits into the RAAF structure. I started this thread to stop constant new threads being created on every single F-35 news article, with the associated factually false claims and rumours that people would subsequently post. Now there is a whole thread of valuable information, both good and bad, on the aircraft. I obviously don't own this thread and welcome anyone else posting what they come across or discussing the aircraft and its capabilities. I learn a lot from reading and posting the articles here so see that as the bonus for the little time it takes. I assume Skeen is leaving for a better position and not leaving the Rapid Capabilities Office due to issues or conflicts. Based on her experience outlined in the article she seems well qualified to take up the position. Six months into the job, the head of the U.S. Army’s Rapid Capabilities Office is leaving to join the F-35 Joint Program Office as its top civilian. Some info on the fix for the Navy green glow issue from the helmet LEDs. Good news is the same fix will roll out to the entire fleet, A and B models as well as C, when the helmets go through programmed maintenance. A burst of green light in F-35 helmets that was plaguing Navy pilots landing their aircraft at night has been solved using a component found in many consumer televisions. The so-called “green glow issue” occurred when Navy pilots at sea were landing on aircraft carriers in blackout conditions, said Joe F. Ray, marketing manager for airborne government systems at Rockwell Collins. The helmets use LCD (liquid crystal display) technology, which uses backlight to create images. The displays are not 100 percent opaque, so it can’t block out all the light. That resulted in a green glow bleeding from the edges, said Josh Rivera, a systems engineer at Rockwell Collins. Rockwell Collins and its partner in the F-35 helmet program Elbit Systems of America, had already focused on organic LED (light emitting diode), a relatively new technology found in televisions. It did not exist when the helmets were first being designed at the outset of the F-35 program. The main feature of organic LED is that a series of pixels light up when it receives an electric current. Light only comes on when it is needed. “You are only getting the visual information and the visual cues that are required in the display,” Ray said. As a new technology, it won’t be obsolete for quite some time. It’s also lighter and uses less power, he said. As a bonus, it allows the icons in the heads-up display to have more color. Current models are the typical monochromatic green. “So it’s a really good technology that seemed like a no-brainer for everyone,” Ray said. “It was just a matter of working it through the wickets with the” joint program office and prime contractor Lockheed Martin, he said. Initial operating capability for the upgrade is expected in February 2019, when newly issued helmets will all come with the fix. The Navy will also begin to bring in old helmets for the upgrades. As for Air Force and Marine Corps pilots, the green glow problem has not been as big an issue because they don’t fly in the same blackout conditions. However, when their helmets come in for repairs, they will receive the upgrades, Ray said. Some interesting video footage of the F-35 Fort Worth production line. Jeff Martin pays Lockheed Martin's F-35 production line a visit to see how the stealthy fifth-gen fighter is made. COLOGNE, Germany — The German Air Force and electronics specialist Hensoldt are gearing up to deploy a new sensing technology in southern Germany that promises to target enemy aircraft without pilots knowing they are being tracked. The company first unveiled its TwInvis passive radar system at the Berlin Air Show in April, where it was rumored as a technology with the potential to detect stealthy aircraft like the F-35. As we have discussed previously I am incredibly sceptical of their claims. I would look forward to seeing a test report but I doubt that will ever see the light of day. The proof will likely be in the number of nations that end up acquiring it but I highly doubt it will be the panacea some are claiming. Despite this development, and there is nothing overly novel or new about passive radar, Dassault, Airbus, China, Russia, the USA, India, Japan, Turkey etc are all continuing development and production of stealth platforms. They don't develop them for their stealthiness alone. They develop them to have a platform to include a bunch of new tech. Apart from that, it's good to be skeptical. I'm really skeptical about sales numbers as long as the politics of arms sales are at work. The capability of the expeditionary fleet to defend itself is clearly improving with the F-35B now being about to link data back to amphib vessels. Perhaps a CV-22 with AWACS radar mod is not really required or the limited aviation space on vessels such as the USS WASP would be better spent on additional F-35Bs. Raytheon's Ship Self Defense System created the first-ever digital air connection between a U.S. Navy ship at sea and a U.S. Marine Corps F-35B Lightning II Joint Strike Fighter aircraft in the sky. This provided demonstrated proof of the combat system's ability to pass along digital tactical data from a JSF through a deployed Expeditionary Strike Group, in this case the USS Wasp. Known as Link 16 Digital Air Control, this capacity gives a tactical, wireless integration between surface ships and aircraft, and offers improved mission efficiency with an expanded situational awareness and interoperability, according to Raytheon. This new capability plays to the strength of the F-35, which can also collect and share data using its Multifunction Advanced Data Link. The link allows the fighter jet to use its sensors to collect data which it can immediately shared with commanders at sea, in the air or on the ground, giving instant, views of ongoing operations, according to Lockheed. Link 16 Digital Air Control will allow the F-35 to "quarterback" missions by passing along data to help ships and other aircraft detect targets, deliver mission assignment and engagement status exchange without voice communication and share aircraft status information, like fuel levels and weapons inventory information. The Navy and Raytheon collaborated to modify the current SSDS baseline, MK 2, to initiate the DAC interface. The successful connection came after 18 months of developing and testing the interface to before delivering it to the USS WASP. Now, more SSDS ships will be outfitted with the Link 16 DAC capability upgrade, Lockheed officials said. "Information is key for any Commander -- and shared information from multiple sources and vantage points extends our battlespace and our advantage over enemy threats," U.S. Navy Captain Danny Busch, of the Program Executive Office -- Ship Self Defense System, said in a press release. "Now with the ability to link our sensors and weapons, from sea and air, SSDS is providing a level of interoperability and defensive capability never before available to the Expeditionary fleet." Assuming this system can work and it is an innovative idea it depends on the power grid being up. Even robust power grids are easily taken down in any serious attack. Well, that is why any such system has robust inplace backup power systems ready to come online when needed. Any military station of scale and importance will have that. The system is reliant on civilian infrastructure which obviously has less specific power redundancy. I am sure the system itself has backup but this system is collecting and analyzing RF signals from TV, radio and cell phone systems all of which rely on the electrical system which is easily taken off line in the first minutes of any serious invasion. Powerplants are one of the early targets. Stops power, water, AC, cell phones, 4G, phones, web, and all those gadgets that would be useful for defense. Realistically today there may not be as much of a need to kinetically strike these types of targets anyway. Cyber intrusion may be the preferred option to either shutting down or messing with the civilian infrastructure enough to create the effect desired, especially if it doesn't alienate a civilian population. I don’t know enough to be able to comment on cyber but even if power systems are secure against it there are other, if less elegant ways to take down a grid very early on. - Counter-Electronics High Power Microwave Advanced Missile is a non-kinetic payload, developed by Raytheon that can disable enemy electronic systems. - The system is presently capable of fitting to CALCM (Conventional Air-Launched Cruise Missile) and potentially, other platforms. According to a 1999 Boston Globe article, “Blackout Led to Weapon that Darkened Serbia”, chaff (strips of metal military planes use to defend against missile attacks) was dropped mistakenly on a power station in Southern California. The result – the power station was disabled and Orange County’s power supply was disrupted. This simple technique was turned into a cluster bomb and used first against Serbia on May 2nd 1999. F-117A Stealth Fighters dropped these weapons on Serbia power stations and the lights went out in over 70% of the country. The weapon was used again 5 days later to hinder Serbia’s attempt to restore power. In the opening days of Desert Storm, modified tomahawk cruise missiles were used against Iraq. The warheads were made up of bomblets that contained spools of carbon fiber wire. The fine wire shorted out power plants and disabled 85% of Iraq’s electrical production capability. Some additional Blk 4 funding, this specific award appears to relate to partner weapons integration activities. The US Department of Defense (DoD) announced on 2 November that it had awarded a $130M modification to a previous contract for F-35 Block 4 upgrade. According to a statement, release put out by DoD, Lockheed Martin Corp., is awarded a $130,359,625 modification to a previously awarded cost-plus-incentive fee contract (N00019-18-C-1004) in support of the F35 Block 4 Pre-modernization Phase II effort. This modification provides for pre-modernization requirements decomposition and design work for Block 4.1 Partner participant weapon capabilities for maturation to an air system requirements review level of maturity. Work will be performed in Fort Worth, Texas, and is expected to be completed in March 2020. Fiscal 2018 research, development, test and evaluation (Air Force, Navy); and non-U.S. Department of Defense (non-U.S. DoD) participant funding in the amount of $90,505,737 will be obligated at time of award, $13,262,261 of which will expire at the end of the current fiscal year. This modification combines purchases for the Air Force ($17,557,293; 13.5 percent); Navy ($14,223,730; 10.9 percent); Marine Corps ($14,223,730; 10.9 percent); and the non-U.S. DOD participants ($84,354,872; 64.7 percent). The F-35 related parts of the news article are shown below. No surprise that Eglin is a candidate for additional F-35s. We have also heard the cost reductions comments before but good to see it continue to be reinforced by the Deputy Defense Secretary. With regard to the F-35, which has been plagued by cost overruns, slipping schedules and spare parts issues, Shanahan suggested that the fifth-generation stealth fighter jet is a needed addition to the American military fleet of fourth-generation fighters like the F-16. 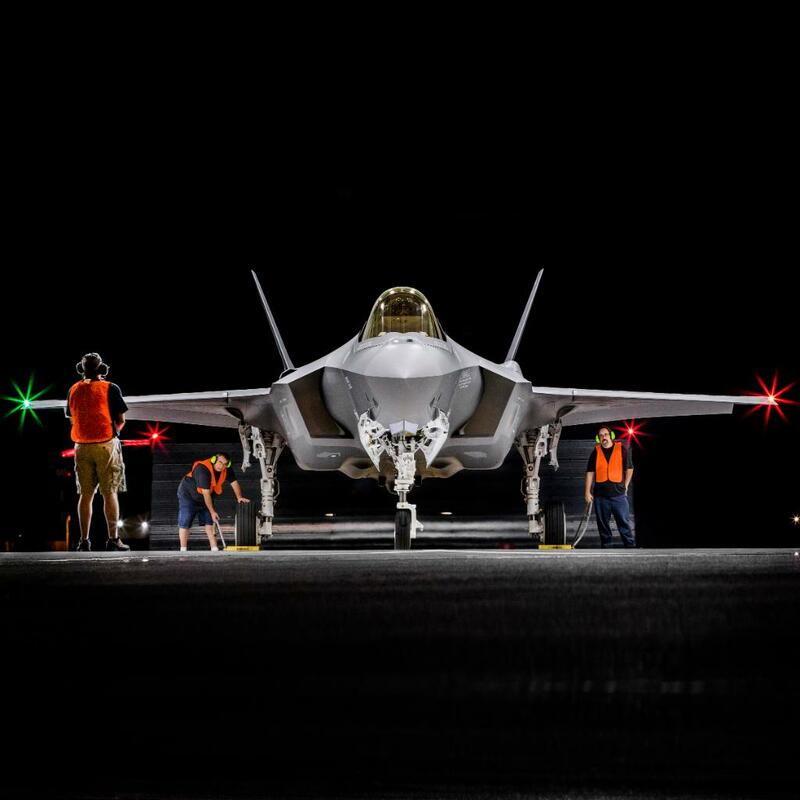 “The aircraft we do have are aging,” Shanahan said, adding that the F-35 will bring with it a “multi-domain” capability, electronically linking its operations with ground, sea, space, cyberspace and other air-based military equipment and units. But, Shanahan conceded, “the issue is affordability. My job is to get the costs down ... to be comparable to a fourth-generation” fighter jet. The Air Force version of the F-35, also used by most foreign buyers, dropped to just below $90 million in a recent deal between the Pentagon and defense contractor Lockheed Martin. Earlier this month, Eglin’s 33rd Fighter Wing spokeswoman Lt. Savannah Stephens confirmed that high-level Air Force and Department of Defense officials are considering bringing additional F-35s to the wing. There are currently 33 F-35s on the 33rd Wing’s flightline. The wing is authorized to have as many as 59 of the fighter jets. The discussions are part of ongoing considerations regarding “strategic basing” of the F-35 — determining where the aircraft would fit best in meeting military mission requirements, according to Stephens. Some very decent numbers on trials conducted by the F-35B on the QE. Good to see they are already ahead of schedule. HMS Queen Elizabeth has announced that her historic flight trials in US have resumed. The Royal Navy's £3.1bn aircraft carrier spent a week in New York City last month after concluding the first part of the tests. She is on deployment in America testing F-35 Lightening jets – having left Portsmouth in August. In a tweet today (November 1) the warship announced that the second round of flight trials had resumed. What has been achieved in flight trials so far? Before handing over the reins of the HMS Queen Elizabeth, the aircraft carrier’s first ever CO Captain Jerry Kyd said: ‘It has been a superb effort by everyone across the Integrated Test Force and HMS Queen Elizabeth so far – I could not be more pleased with the team spirit and dynamism shown by all. ‘That has delivered a volume of quality data which has put us well ahead of where we expected to be at this stage. HMS Queen Elizabeth’s historic flight trials will resume with far more achieved in the first three weeks than anticipated. - and even some rough weather trials to begin pushing the conditions in which the carrier can operate her air power safely. Some interesting comments on F-35 simulators and their expanded use, including networking various simulators around the globe together (which can already be done with some simulators). What was good to read was that all simulators are already using Blk 3F and have been very good at keeping up to date as well as a recognition of the development path ahead and the requirement for the simulators to keep up to date. Simulators provide a significant capability for the F-35 given it is difficult to train the aircraft against full up threats all the time. Hence the scenarios they can throw at a 5th gen fighter virtually can allow the aircrew to train to a potentially higher proficiency. Lockheed Martin first received the $8.5 million contract award calling for the introduction of DMT across the F-35 program in March 2018. The contract sees the introduction of DMT occurring globally through May 2021. Dixon said F-35 training software has been continuously updated in line with communications, navigation and surveillance upgrades being introduced to the aircraft itself. Over the next 10 years, the fifth-generation fighter jet will see some 60 different software and hardware upgrades, including Raytheon’s upgrade to the distributed aperture system (DAS) to be introduced beginning with Lot-15 F-35s. “The simulators we’re using are operational flight program technology, meaning they have the exact same software and code that the aircraft has, there’s no difference. One of the capabilities that we try to ensure the pilots are used to is turning the DAS mode on and looking through the airplane,” said Dixon. F-35 simulators have now all been upgraded to include Block 3F training software as well. That upgrade has additional weapons, communication and expanded sensor mode upgrades among other new functionality. While Dixon did not provide a firm date on when the new DMT training technology would become available, it will start in the U.S. before expanding to F-35 pilots training in the U.K.
"That capability will start to roll out next year, we’re going to start with the Air Force as the lead recipient, and then we’ll continue to follow that with the U.S. services and the U.K.,” said Dixon. Nammo has successfully completed the first live firing of the only GAU-22 test gun installed outside the United States. Located at Nammo's test center at Raufoss, Norway, the gun will allow Nammo to conduct a full range of testing and verification of its APEX ammunition, developed specifically for the F-35, before it is delivered to the customer. The Apex ammo is a product of Norway and is next to the JSM missile by Kongsberg the most important Norwegian contribution to the F-35 program. F-35 units at Hill AFB continue to extend their capability and preparedness with realistic exercises. The invoices sent to the Dutch Ministry of Defense for the development and purchase of US F-35 combat aircraft - the stealth fighter also selected by Belgium - contain a "significant number of errors," the court said. The court of inquiry has investigated with his Norwegian counterpart - Oslo plans to buy 52 F-35 - on the calculations made by the two ministries of defense, partners from the beginning of the development of this aircraft also known as the "Joint Strike Fighter" (JSF). This led the Netherlands and Norway to ask the Pentagon and the aircraft manufacturer, the US group Lockheed Martin, for more information. The court of auditors concluded that the Dutch Defense was properly controlling the invoices from the United States. The department detected between January 2017 and June last year 59 errors - out of 838 calculations - in F-35 related accounts. This number is "more important than what can be expected," said a spokesman for the court of accounts. The errors are mainly in the calculations made by the Pentagon and not in the Lockheed Martin bills. According to the Court of Auditors, it is important for The Hague to conclude good new agreements with partner countries and suppliers during good new purchases and to check them correctly. The report stresses that the errors were discovered and corrected in time by the Ministry of Defense and urges partner countries to introduce additional checks on payment claims. The Netherlands has decided to set aside 4.5 billion euros, including VAT, for the purchase of 37 F-35 Lightning II, a device developed by the United States and eight of their partners. Belgium, which is not part of the initial partners of the JSF program, decided last Thursday to acquire 34 aircraft, for a total of 3.8 billion euros, a purchase exempt from VAT. A potential slow down of Italian F-35 orders but it appears it is dropping from 10 over the next 5 years to 6 or 7 which is inconsequential to the program. No indication on which variant Italy will take or whether it will be both. Italy will stretch out the order of F-35 fighter jets, buying six or seven of the aircraft in the next five years instead of the previously planned 10 jets, a government source told Defense News. The decision follows a review of the program by Italy’s populist government, which took office in June and is mulling defense spending cuts to pay for social welfare programs and cover tax cuts. The source said the plan did not envisage a reduction in orders, merely a slowdown of intake, which would leave the decision of the total F-35 purchase to a future government. Previous governments planned to buy 60 F-35As and 30 F-35Bs for a total of 90 aircraft. The new government will focus on spending plans over its five-year mandate and not beyond, the source said, adding that discussions are underway with the U.S. about the change in schedule. The decision on the slowdown keeps with Italian policy on the F-35 set out by Defence Minister Elisabetta Trenta after she took office in June. “What I would like to do is lighten the load, since we have other spending commitments in Europe. We will try to stretch out deliveries instead of cutting the order, which would reduce offsets and mean penalties,” she told Defense News at the time. Italy has taken delivery of 10 F-35As and one F-35B. Two of the "A" models as well as the "B" model are being used for training in the U.S., while eight "A" models are now based at the Italian Air Force’s base in Amendola, southern Italy. Trenta was tapped for office by the Five Star party, one of two political parties in Italy’s current coalition government. Five Star politicians took a hostile line toward the F-35 program before taking office, at one point promising to scrap it. However, a defense spending document released last month suggests the government will maintain spending on the program in the next two years, with €766 million (U.S. $874 million) due to be spent in 2019 and €783 million in 2020. Those figures should be treated as provisional until the overall budget is signed in Parliament in the coming weeks. Five Star politicians have also shown hostility toward another U.S. defense program — the ground station planned in Sicily to support the Mobile User Objective System, or MUOS, network, a U.S. Navy-run satellite network providing voice and data communications to U.S. military personnel and platforms around the world, even when they are under thick forest canopies. Long held up by legal challenges in Sicily amid health fears, sources have said the MUOS antenna in Sicily could soon see final approval from the Italian government. LM have done very well with deliveries this year, more delivered already than last year and apparently on target to hit the 91 forecast. Looks like the incentives that the JPO put into the contract to encourage on time delivery may have helped. We've already delivered 67 F-35s this year – more than we did in all of 2017! We are on track to meet our 2018 delivery commitment of 91 F-35s, a nearly 40% increase from last year. Pictured here is the 91st jet to roll off the production line in 2018. This is among 24 others currently undergoing final finishes, test and flight operations, that will get us to the 91 aircraft delivery goal! Yeah, I have to wonder about a report saying that two were struck by lightning and uninjured. Defence Connect can now confirm that Australia's first two F-35 Lightning II Joint Strike Fighter aircraft will be arriving at RAAF Base Williamtown on Monday, 10 December 2018. The RAAF experience: From pilot to the commander. Over the coming years Australia will purchase 72 of the advanced fifth-generation fighter aircraft as part of the $17 billion AIR 6000 Phase 2A/B program, aimed at replacing the ageing F/A-18A/B classic Hornets, with a potential expansion of the contract to 100 aircraft. Fifth generation fighter aircraft represent the pinnacle of modern fighter technology. As a fifth-generation aircraft, the F-35 is a blend of all-aspect stealth even when armed, low-probability-of-intercept radar, high-performance air frames, advanced avionics and highly-integrated computer systems bringing a gods-eye view of the battlespace. Neale Prescott, director of business development for Lockheed Martin Australia, described fifth-generation technology as "the combination of low observability, which is built into the airframe from the design phase, and sensor fusion, combining radar, infrared senors and a distributed aperture system allowing pilots an unrivalled view of the battlespace". In addition to acquiring 72 aircraft, Australia's F-35 project will also deliver facilities, weapons and new support systems to meet fifth generation requirements. The workforce will also need to transition to meet fifth generation approaches to operating and sustaining Australia's F-35A fleet as part of a global F-35 network. Australian industry participation in the F-35 program has resulted in 15 direct companies participating in various stages of the F-35 program, including manufacturing, training, maintenance and sustainment. Early commitment to the global cooperative F-35 program has secured Australia as a key strategic partner and enabled Australian industry access to global supply chains. This has already contributed significantly to Australia’s economy, with Australian industry having secured over $1 billion in production contracts to date through the global F-35 program, with additional work expected as the production rate ramps up over the next three years. The F-35 will provide more than just a quantum leap in capability for the RAAF and the individual warfighter. The aircraft will be responsible for supporting thousands of jobs around the nation, with Defence setting the key target for Australian industry participation in the F-35 program to be between $6-9 billion of production and sustainment work,through to 2050. Discussing the industrial impact of the F-35, Lockheed Martin Australia F-35 program manager Andy Doyle said: "In the prime space we have seen growing collaboration and partnerships between the likes of Lockheed Martin, BAE Systems Australia, Pratt and Whitney and Northrop Grumman." "This collaboration has filtered through to supporting the growth and integration of key Australian SMEs like Marand, Quickstep, Varley, Milksil, TAE and RUAG in supporting the various components, maintenance and sustainment processes which combine to create the F-35," he said. TAE Aerospace, based at Amberley, was assigned regional F-35 engine depot maintenance responsibility for the Asia-Pacific region. As a key part of developing a sovereign training, maintenance and sustainment capability, the Air Force, CASG and industry partners have collaborated to enhance the way Australian industry, both primes and SMEs participate in the project. Original equipment manufacturer Lockheed Martin has been working closely with Australian industry partners, such as training provider Milskil, to prepare for the arrival of F-35 initial operating capability (IOC) in 2019. As part of the F-35 Lightning II JSF Integrated Training Centre (ITC) at RAAF Williamtown, Milskil will provide key training solutions, including the Aircraft Systems Maintenance Trainers (ASMTs) currently being installed, which will allow students to immerse themselves in all core maintenance tasks on the F-35. This training technology enables more robust, immersive maintenance training to occur without tying up aircraft to do it. Meanwhile, for Australian SMEs like Quickstep Holdings, Marand Precision Engineering and Heat Treatment Australia, Australia's F-35s have provided unique opportunities for both local and global reach as they play a pivotal part in Australia's industrial participation in the global supply chain. "From a production perspective, Australia's involvement in the F-35 program is a successful example of the government's defence industry capability plan. Australian industrial participation has the opportunity to support the entire production run of the 3,000-plus aircraft and the corresponding block upgrades which will be implemented throughout the life of the F-35," Doyle explained. Prescott reinforced this, saying: "Australian industry will see huge benefits from 2023 when we have the entire fleet of Australian aircraft in country and this will continue as Australia expands its role as a regional maintenance, sustainment and training hub for both Australian and allied F-35s throughout Asia." Quite the click bait title based on the few comments that cover the F-35. Essentially Shanahan is saying the time is right to get the sustainment on the F-35 in place properly and focused on cost reduction instead of trying to fix it once too many jets are in service. His comments are actually quite upbeat on the platform and the potential. When Patrick Shanahan arrived at the Pentagon as the new deputy secretary of defense in July 2017, his impact was unclear. A career in Boeing had brought Shanahan in contact with both the defense and commercial divisions, but he had never worked inside the department — and now he was in charge of driving internal reforms for Secretary of Defense Jim Mattis. Fourteen months after arriving, Shanahan sat down with Defense News to discuss his first year, his priorities for year two and “systemic” change that he hopes will outlast his tenure. You’ve talked in the past about acting as the chief operating officer for the Pentagon. What does that mean in terms of long-term goals? As you can imagine in a place like this, the scale is enormous. So it’s not about a communication plan, it’s actually about how do you change the nature of the work, or where resources are applied, to actually undergo the change and start to put the strategic changes into place. It’s very easy in a complex environment like this to get distracted. The tactical can consume an enormous amount of time. But my job is really to drive change at scale, and there’s a formula for doing that. And the formula really has to do with change [that] must be systemic. It's all about the system and then the reinforcing mechanisms to make that change enduring. Without a system, things fall apart when the leader moves on. The system or the environment shouldn't be dependent on the leader's presence. Lay out how you tried to get at that in the first year. There’s a tactical side of this, and then, kind of, back to the systemic change. The systemic change that we’re really driving in the department is to really have a real robust sustainment system, deliberately, because you can only pick so many things in terms of where you spend your time. What you want to avoid in an organization is setting too many goals. Picking the right goals forces you to get many other things right, so if you’re very deliberate on what you choose, you can get a multiplying effect. If you over-engineer a solution, it creates confusion in organizations. So we said: “What’s the most important thing?” Generate readiness, that’s what the [National Defense Strategy] calls out for. Drive operating costs down. After the initial burst of readiness focus, you wanted to turn to modernizing systems within the department. Are you satisfied with the pace of the modernization pushes? Well, I think it could have gone faster. The big go-to [when I started] was just like other large organizations: Get a strategy in place and move out on the most important elements of the strategy. The longest lead items are modernization, and then the most urgent need is when you have North Korea, all the things going on in the Middle East, readiness. So in terms of my time now, now we’ve got those things underway, I wanted to make sure the foundation was laid for IT. That was the most important one. I’m over-the-moon happy with what we’ve been able to do with CYBERCOM, [but] I’m super frustrated that we can’t go faster on basic things like the cloud. Defense Health Agency, you have to be risk-balanced on health care. And I’d like to go faster on logistics. There are a number of things that are foundational to being able to achieve enterprise solutions that, you know, are going through the procurement process. There isn’t anybody intentionally standing on the air hose, but government procurement is very deliberate. And so there’s a number of those that we have to refine. So I wish that would go faster. How do you prioritize between health care, IT and the broader logistics areas? In terms of health care, that’s the biggest. Again, it’s back to systemic; how do we reduce the number of pharmacy systems? How do we get common procurement? In the health care area, it’s not about changing the quality of care. How do you consolidate back-office costs? How do you leverage procurement? The IT one to me is the most interesting. When you think about the biggest leverage for us in the future, most of everything we do is software-driven, how do we get — it’s not like just a common architecture, but it’s the right platforms and the right level of integration so that we can inoculate ourselves from the cyber standpoint, have the means to do high-end computing so that when we do have those algorithms for AI, that the time frame in which you need to make those decisions, the computing environment supports that. So we have for our digital modernization a really great road map. Now that we have that, we can start kind of consolidating [data centers], we can start to move to Office 365. We can get to a common financial system. You spent years at Boeing, and when talking about getting aviation rates up, you’ve said commercial practices could help. What does that look like? Implementing commercial best practices at DoD starts with a mindset. Instead of developing our own unique solutions to every problem, we should use commercial best practices whenever it makes sense. Examples of this cover almost every aspect of what we do at the DoD. In reform, we are using category management to better ensure that we get the best price for goods and services across the enterprise, and don’t buy the same thing for different prices in different places. In sustainment, we are deploying the same techniques to Navy aviation depots that are used to maintain commercial airplanes. In space, we are seeking to leverage low-cost access to space and the rapid innovation we are seeing in low-cost satellites. In digital modernization, we are moving to the cloud for speed, security and scaling that it provides. You’ve mentioned the need to avoid having the services develop duplicative systems. How do you square that with the fact the services got more acquisition power under the recent acquisition reorganization? The circle gets squared with relationships. [Look at] Army Futures Command, with Gen. [John] Murray developing some of these agreements. He’s going to have the acquisition responsibility, but what we’re going to do as a department is agree that he’s going to use these interfaces and standards. Because what’s happened in the past is they’ll have a need date and we’ll have not been responsive to giving them what they need, and so they have to move out by virtue of the schedule that they committed to. That’s the horizontal play that we’ve got to work to here in the department. If we get that, then we’re joint beyond anybody’s wildest dream. Are you satisfied with how Lockheed Martin is proceeding on the program? I’m never satisfied. We can always get better performance. And I think we need to deliver more to the war fighter and the taxpayer. It’s not a “us or them” [situation], it’s a “we owe it to the people.” And everyone is heads-down focused on doing that. You intended to have the defense budget finalized around Dec. 1, 2018, at a $733 billion level, and then President Donald Trump announced it will actually be at $700 billion. How do you intend to make this work? Is it safe to say the savings are going to have to come from modernization priorities? At the most foundational level, the easiest thing to defer are things you haven’t started. Which, almost by definition, is a lot of the modernization. But modernization has many elements to it. So there’s some important capabilities you might want to deliver that you don’t have to defer. It’s not that modernization is monolithic. You might say: “Well, this portion, we’re just going to have to delay, or in this region of the world we’ll have to go slower.” We’re not going to go backwards on the hard work that we’ve done, on the readiness that we’ve recovered. We’re going to keep generating that lethality. This will be a big contract and I believe is the first year of the bulk buy that Allied partners are signing up for. The U.S. Defense Department expects to award Lockheed Martin Corp (LMT.N) an interim contract for a 12th batch of F-35 fighter jets “very shortly” and finalize the deal by next spring, the Pentagon’s chief arms buyer Ellen Lord said. When completed, the deal will mark another step forward for the world’s biggest weapons program after years of turmoil, cost overruns and schedule delays. Belgium last month picked the aircraft over the Eurofighter Typhoon as replacement for its aging F-16s, agreeing a 4 billion euro ($4.5 billion) deal that made it the 12th country to select the F-35.. Negotiations on the U.S. contract are moving quickly on what is expected be the largest order to date for the F-35, Lord told Reuters at a NATO industry conference. She said she expected to wrap up the deal much faster than with the previous tranche, but gave no details on the number of jets or the value of the deal. Sources familiar with the matter say the deal will cover more than 250 F-35 aircraft for the U.S. military and other allies. The initial placeholder agreement will set a not-to-exceed price that could be as high as $20 billion, but military officials aim to negotiate a price well below that during the coming months, the sources said. The Pentagon in September wrapped up an $11.5 billion contract with Lockheed for 141 F-35s, lowering the price for the most common version of the stealth jet by 5.4 percent to $89.2 million. Lockheed has said it expects to cut the price of the F-35A to $80 million by 2020. U.S. President Donald Trump and other U.S. officials have criticized the F-35 program for the delays and cost overruns, but the price per jet has declined as production has increased. Negotiations about the 11th batch of jets dragged on much longer than expected because Trump-appointed Pentagon leadership drilled deep into the costs, people familiar with the talks have said, but Lord said she is determined to complete the current round of negotiations much more quickly. The contract will also benefit Northrop Grumman Corp (NOC.N) and Britain’s BAE Systems (BAES.L), which are key suppliers to Lockheed on the aircraft, as well as engine maker Pratt & Whitney, owned by United Technologies Corp (UTX.N). More than a decade late and innumerable billions over budget, it's crunch time for the F-35 Lightning II program. Its manufacturers insist it's ready. Its supporters say none of its remaining problems are insurmountable. Auditors and the Pentagon are not so sure. All three versions of the Joint Strike Fighter - the F-35A built for the US air force and the RAAF, the F-35B 'jump jet' built for the US Marines and UK navy, and the F-35C built for the US Navy - will this month begin a seven-month in-depth assessment. The purpose of the tests are to determine if the jets live up to expectations. But doubts persist: have all of its 'critical' flaws been addressed? And the F-35 project is already two months late. The original evaluation start date was September. This was missed due to a late 'critical' software update. Now the entire 11-month evaluation program must be squeezed into just nine months. If they make the grade, the F-35's current 'low-level' production runs will be accelerated. The assembly lines will be cranked into high gear to mass-produce the hundreds ordered by the US and its allies, including Australia. The Royal Australian Air Force has taken delivery of nine early-model F-35As. It has committed to purchasing a total of 72. The initial operational test and evaluation (IOT & E) process kicks off tonight. But a poor showing could further delay the project and add substantially to its overall cost. Between now and July next year, a handful of F-35s of all types will be put through their paces. Can they operate in cold weather? Can they be kept operational given the exposure to weather and limited facilities available on aircraft carriers? Can they fight - and win? It's a process intended to reassure customers - and critics - that the controversial jet has overcome most of its problems. It's a process that has already been delayed several times. Most recently, a September 15 start-date was missed due to delays in the provision of a vital operating software update. However, the new November start date maintains the September deadline. The Joint Strike Fighter Operational Test Team (JOTT) says it believes it can complete IOT & E by the original July 2019 date. But, to do so, it must hurry things along - and "assuming more risk". Some 300 F-35s are already in service. And several squadrons have already deployed on 'limited' operational tours. The US Marines has had their jump-jet version active since 2015. And the US Air Force has a few of its strike-fighters since 2016. It's already fired its first shots in anger. Israeli F-35s reportedly engaged in two strikes "somewhere in the Middle East" in May. On September 27, a Marine Corps F-35B, launched from the USS Essex amphibious warfare ship, struck targets in Afghanistan. It hasn't all been plain sailing. The most troubled version of the F-35, the "B" variant jump-jet, suffered the first ever crash of the type in September. The pilot ejected and survived. But the jet, worth more than $100 million, was destroyed. The cause was traced to faulty fuel-lines, prompting the grounding of the entire fleet for assessment and repairs. In August, the Pentagon's aircraft testing director reported that the F-35 simply was not ready to undergo the crucial combat evaluation tests. Director of operational test and evaluation Robert Behler ruled that he would not accept testing of an aircraft that did not have the same operational software as production aircraft. And he pointed out the F-35s operating software, mission-data system, self-diagnostic and self-reporting systems were not up to scratch. The September start date also was delayed to ensure F-35 on-board artificial intelligence - the Autonomic Logistics Information System (ALIS) - reported accurate mission flight test data. This was accompanied by concerns of "key technical deficiencies" including the F-35's ability to effectively use one of its primary weapons - the AIM-120 Advanced Medium-Range Air-to-Air Missile (AMRAAM). Its on-board cannon was also judged to be out-of-alignment, consistently firing to the right of the crosshairs and missing its target. It is not known if the software fix applied to the aircraft since September has addressed all these issues. That, however, will become apparent under the eyes of the evaluation umpires in coming months. The Project On Government Oversight (POGO) in August found F-35 program officials had been cooking the books. It accused the program of altering paperwork to make to appear as though the F-35 had completed its development phase - when it had not. And this, it said, was potentially life threatening. At the heart of the issue is a list of long-known design flaws. POGO states reports had been altered to make it look as though progress had been made in addressing these issues, when in fact nothing had been fixed. "F-35 officials are recategorizing - rather than fixing - major design flaws to be able to claim they have completed the program's development phase without having to pay overruns for badly needed fixes," the POGO report reads. "Several of these flaws, like the lack of any means for a pilot to confirm a weapon's target data before firing, and damage to the plane caused by the tailhook on the Air Force's variant, have potentially serious implications for safety and combat effectiveness." The Defence Department is slated to make a decision on full rate production by the end of 2019. Though this is entirely dependent upon the evaluation program's outcome. Under US federal law, this cannot begin until the director of operational test and evaluation office agrees the F-35 program has met all of its agreed-on criteria. But the new US deputy secretary of defence isn't so worried about whether or not the F-35 is up to the task: He's more worried about whether or not that lasts. "We know long term, the biggest challenge for the F-35 is not going to be the performance of the aircraft, it's going to be affordability," Shanahan said. "In the next two years, we double the fleet. And if we don't really have a robust, high-performing sustainment system, it'll divert attention of the F-35 program from other critical areas like development or production, and it'll create disruption in the supply." The F-35 has been flying in some form or another now for 17 years. Some 300 early examples have already been delivered to the US and its allies. All nine of Australa's F-35s are currently situated at a US training facility in Arizona. The first two to be permanently stationed in Australia - at RAAF Williamstown in NSW - are due to arrive on December 10. Most of those will likely need extensive upgrades, repairs and modification to bring them up to fully operational standards. The complete force of 72 Australian jets is due to be delivered by 2023. It's a $17 billion project aimed at replacing Australia's ageing F/A-18 A and B model Hornet strike fighters. It's an incredibly ambitious aircraft. To maintain its standards of stealth, all components must be precisely fitted. Even being a millimetre out can produce a surface producing unwanted radar reflection. All this requires high quality materials and precision engineering not previously applied to aircraft. Then there's the complex and integrated nature of its sensor and weapons systems. Pulling it all together requires powerful software. According to US Air Force records for its F-35As, the type achieved only a 55 per cent availability rate during 2017. That's a lot of down time in the hangar. It also means a greatly reduced presence of aircraft on the 'front line'. Availability objectives require more than an 80 per cent readiness state across the operational fleet. Clearly, the F-35A still has some way to go to reach that goal. The JSM has the potential to become the default naval strike missile for the F-35, especially as the NSM moves into the LCS fleet in the US. BAE Systems Australia and partners Kongsberg Defence have developed key technology to support the integration and export possibilities of the Joint Strike Missile as part of the global F-35 project. Since the retirement of the F-111 in 2010, Australia has been without a credible long-range aerial strike platform. In response, Australia, in collaboration with Norway, signed on to help finance and develop an air launched variant of the Kongsberg Naval Strike Missile (NSM). Like F-35, the JSM is a fifth-generation platform providing the F-35 with a long-range anti-ship and land attack capability. The JSM is designed with a stand-off range to protect the launch platform from being detected and engaged by enemy air defence systems. As part of BAE Systems Australia's central role in supporting systems integration in the F-35 program, Kongsberg and BAE have partnered to support the future integration of the JSM into Australia's F-35s. This has been divided into two key areas of focus, with Kongsberg Defence Systems performing design, testing and risk reduction activities working towards fully integrating BAE’s passive radio frequency (PRF) sensor into the existing JSM missile systems. To assist this activity, Kongsberg received several of BAE Systems' qualification standard PRF sensors, and these have been used to ensure interface compliance with the extant missile systems and to ensure physical compatibility. BAE Systems aerospace and integrated systems director Steve Drury said, "This is a great example of Australian advanced technology creating jobs, with the backing of government funding." The initial units were produced at BAE Systems Edinburgh Parks facility in South Australia. Kongsberg has since contracted BAE Systems to produce low rate initial production (LRIP) units. These LRIP units have been delivered in two batches and will be used in Kongsberg’s ongoing qualification program supporting the JSM program. BAE’s work on the JSM commenced in 2009 and was supported by the Commonwealth’s Priority Industry Capability Inno­vation Program (PICIP). In 2015, in response to the ever-changing threat environment, BAE Systems further enhanced the PRF sensors capability. This additional functionality was included in time for the BAE Systems qualification program and has been included in all future sensors. The BAE Systems qualification program ended in Q4 2017, coinciding with the commencement of the LRIP contract. The LRIP units have been provided to Kongsberg in Q2 and Q4 of 2018. "This project has the potential to provide long-term sustainable exports for Australia," Drury explained. According to Kongsberg, a number of F-35 partner nations are showing strong interest in the JSM and mechanical fit checks has been performed on several types of fourth-generation aircraft like the F/A-18E/F Super Hornet, F-16, Eurofighter in addition to all three versions of the F-35. There has also been strong interest in introducing the JSM into maritime patrol aircraft (MPAs) like Boeing P-8A Poseidon for internal weapons bay carriage as well as on the wing stations. An acquisition of the F-35 along with the JSM, will strengthen any nation’s threshold, and serve wider coalition interests. The JSM is designed for precision Anti-Surface-Warfare missions with emphasis on penetration of highly defended sea or land targets through a combination of stealth, onboard intelligence and endgame kinematics. This is achieved by the synthesis of low signature, advanced engagement planning, precision navigation, an ultra-low wave adaptive sea-skimming flight profile, the use of high-resolution passive dual imaging infrared (IIR) seeker, salvo compression by near-simultaneous programmable Time on Target, and exceptional agility in the terminal phase. The low-observable JSM can engage targets at sea or on land at ranges greater than 300 NM and with proven Autonomous Target Recognition (ATR), and Aim Point selection support precision attack against highly defended targets. The dual Imaging Infrared seeker gives the missile all weather capability and the IR seeker has been thoroughly tested against all known NATO IR decoys through more than 3000 hours of flight-testing. The JSM system is under consideration by the ADF to fulfil the Project JP3023 naval strike weapon for the RAAF’s F-35A, due to enter service from 2018. The naval strike capability is expected to be fielded under the follow-on Block 4 capability upgrade, due to be incorporated into the RAAF’s fleet from around 2023. I'm not sure Popular Mechanics has a good grasp of how computer hacking is done or the networks available for the jet to be hacked. The F-35's Greatest Vulnerability Isn't Enemy Weapons. It's Being Hacked. The F-35 Lightning II can evade radar while infiltrating enemy airspace to deliver a knockout blow. It's a sophisticated, stealthy fighter with one big vulnerability—being hacked. As the plane finally reaches full production, the Air Force is racing to plug holes that could allow hackers to exploit the jet's connected systems—with disastrous results. The aircraft itself is pretty secure. As Air Force Times explains, there are multiple layers of security surrounding the jet, including PIN numbers for individual pilots and secure authentication in crafting mission packages for uploading into the aircraft computer. A faraway hacker could not, for example, start up the aircraft and force its engine to explode, or cause the airplane to roll off the runway and crash. But whether we're talking about a home computer, phone, tablet, or a hugely expensive fighter jet, vulnerabilities add up the more you're connected with the outside world. Much of the F-35's strength lies in its ability to connect to the wider military and harness big data about the mission. The worldwide F-35 fleet is connected to at least two secure networks designed to maximize efficiency. The first is the Autonomic Logistics Information System, or ALIS, which keeps track of individual aircraft issues and the location of spare parts and equipment worldwide. Every F-35 squadron, no matter the country, has a 13-server ALIS package that is connected to the worldwide ALIS network. Individual jets send logistical data back to their nation’s Central Point of Entry, which then passes it on to Lockheed's central server hub in Fort Worth, Texas. In fact, ALIS sends back so much data that some countries are worried it could give away too much information about their F-35 operations. Another networking system is the Joint Reprogramming Enterprise, or JRE. The JRE maintains a shared library of potential adversary sensors and weapon systems that is distributed to the worldwide F-35 fleet. For example, the JRE will seek out and share information on enemy radar and electronic warfare signals so that individual air forces will not have to track down the information themselves. This allows countries with the F-35 to tailor the mission around anticipated threats—and fly one step ahead of them. Although the networks have serious cybersecurity protections, they will undoubtedly be targets for hackers in times of peace, and war. Hackers might try to bring down the networks entirely, snarling the worldwide logistics system and even endangering the ability of individual aircraft to get much-needed spare parts. Alternately, it might be possible to compromise the integrity of the ALIS data—by, say, reporting a worldwide shortage of F-35 engines. Hackers could conceivably introduce bad data in the JRE that could compromise the safety of a mission, shortening the range of a weapon system so that a pilot thinks she is safely outside the engagement zone when she is most certainly not. Even the F-35 simulators that train pilots could conceivably leak data to an adversary. Flight simulators are programmed to mirror flying a real aircraft as much as possible, so data retrieved from a simulator will closely follow the data from a real F-35. In an interview with Defense News, Brig. Gen. Stephen Jost, director of the Air Force F-35 Integration Office, says there are “a lot of nodes of vulnerability that we’re trying to shore up.” Not only is the worldwide networking system vulnerable, wireless systems used to support the F-35 could also be points of entry for hackers. F-35 pilots are fond of saying that the plane is as much computer as fighter jet. While the use of computers and worldwide networking is a benefit to all of the jet’s operators, the U.S. military and F-35 customers worldwide must be sure the aircraft—and the equipment that supports it—is properly armored against cyber threats. The alternative could be the jet’s greatest advantages being quietly turned against it, the extent of the damage known only once the shooting starts. A follow on to the Lot 12 article posted a couple of days ago. Amazing seeing the numbers start to come in for these production contracts. This lot covers three years of foreign partner and FMS sales and one year of US sales. The US is currently not allowed to participate in the block buy program until the jet has passed IOT&E. Shame really as there would be significant additional cost savings available for everyone once the US starts to block buy. Lockheed Martin has won a $22.7 billion contract to supply 255 F-35 Lightning II fighters for the three branches of the US armed services and international operators. The contract covers 106 F-35s for the USA, comprising 64 F-35As for the air force, 26 F-35Bs for the marines, and 16 F-35Cs for the navy, a US Department of Defense contract announcement states. In addition, 71 F-35As and 18 F-35Bs will go to international programme participants, and 60 F-35As to customers under the Foreign Military Sales (FMS) process. Lockheed receives an initial installment of $6 billion upon signing. The announcement states that the US aircraft will come from production lot 12. It does not state the production lot for the F-35s destined for the international participants and FMS buyers. A rough calculation pegs the average cost per aircraft at $89 million. The deal covers F-35 production into 2023. The work will be undertaken at several locations, with the lion’s share (57%) at Fort Worth, Texas. The award follows drawn-out negotiations between the Department of Defense and Lockheed to lower the aircraft’s price. In September, the two parties signed a landmark deal that lowered the price of F-35As procured in low rate initial production (LRIP) lot 11 to $89.2 million, dropping below $90 million for the first time, and 5.4% better than the previous production lot. The September deal saw the unit prices of the short-take-off vertical-landing (STOVL) F-35B drop 5.7% to $116 million, and the carrier capable F-35C’s 11.1% to $108 million. Deliveries under the September agreement commence in 2019. The UK portion of the block buy. The 17 new F-35B aircraft will be delivered between 2020 and 2022 and will complement the 16 British aircraft currently based at RAF Marham and in the US, as well as two additional aircraft which are already on order. Overall, the UK has committed to procure 138 aircraft over the life of the programme. I am delighted to confirm that we are doubling the size of our F-35 force into a formidable fleet of 35 stealth fighters. This is another massive order in the biggest defence programme in history. Our military and industry are playing a leading role in the F-35 programme. We are now building this game-changing capability that will soon be ready for frontline action. This programme is set to bring an immense boost of £35 billion into the British economy, and it will be welcome news to our firms that many more jets are now set for production. The announcement is also good news for the UK economy, as British companies are building approximately 15% by value of all 3,000-plus F-35s planned for production. It is projected that around £35 billion will be contributed to the UK economy through the F-35 programme, with around 25,000 British jobs also being supported. As the largest operator of F-35s outside of the US, the acquisition of 17 more Lightning aircraft underscores our commitment to the programme. This new contract demonstrates how our Armed Forces are equipped by DE&S with the latest equipment and support. Interesting that Milskil are being training on the F-35 at Luke AFB and not waiting until the jet arrives in Australia. They appear to be a pretty important part of the Australian bed down process and rapid ramp up of jets and squadrons over the next five years. Maverick and Goose have nothing on the next-generation of Aussie F-35 fighter pilots and aircrew, who are being supported by Australian SME Milskil as they provide flight training and maintenance training support to the fifth-generation aircraft. It is widely recognised that the F-35 is a step change in operating capability for the Air Force, but preparing both the pilots and supporting ground crew is an equal capability step change; this is where Newcastle based Milskil enters the fray. Established in 1998 by former fast-jet pilot John Lonergan, Milskil has leveraged the first-hand experience of its managing director and chief executive to position itself as a leading training organisation and Australia's premier fifth-generation pilot and aircrew training organisations. "We've been involved with RAAF air combat training since 2003 and we've been eagerly awaiting the arrival F-35, which will see Milskil not only providing pilot training, but also ground crew maintenance and support training," Lonergan said. F-35 introduces a completely new paradigm in aircraft systems, simulators, training technology, enterprise IT and maintenance procedures compared with legacy platforms and all have been enthusiastically embraced by the Milskil F-35 team. Working in conjunction with the specialised F-35 Integrated Training Centre (ITC), Milskil's central role up until this point has been standing up their local capability to train Australia's future top gun pilots and their supporting ground crew. The F-35 ITC represents a quantum leap in training technology and Milskil's initial cadre has been busy this year working as part of the F-35 team setting up, testing and familiarising themselves with the state-of-the-art training and training support systems in preparation for the start of RAAF personnel training. "Our training support team have been busy establishing their respective roles that are vital to the ITC being able to deliver its training outcomes. They deliver a diverse range of critical capabilities across course management and scheduling, configuration management and logistics, with each role fully integrated into the global enterprise," Lonergan explained. "This is a very exciting time for us at Milskil, we are really looking forward to getting involved with the F-35 once they arrive here and helping to grow the capability of the aircraft as it evolves throughout its service with the RAAF." In critical milestones, Milskil's maintenance instructor teams are nearing the completion of their training and will shortly begin delivering RAAF maintainer training for the F-35 and the unique requirements presented by the fifth-generation platform and its contributing supporting weapons, logistics and maintenance systems. Further to this, Milskil's first instructor pilots have now commenced their F-35 instructor pilot training at Luke Air Force Base in the US and will join the Williamtown ITC training team early next year. These pilot trainers are the first Australian contractor pilots to be trained on the JSF and are among only a very small number of non-US contract instructors globally, highlighting the level of trust the Air Force places in the capabilities offered by Milskil. The company's growing support of the F-35 and the Air Force has seen the company relocate its operations to the Williamtown Aerospace Centre (WAC), which has enabled the company to develop its highly specialised workforce and facility to better support the training requirements of the Air Force. "We relocated our offices to the WAC last year not only to support the JSF, but to take advantage of the facility as the growing centre of gravity supporting the growing Air Force capabilities at Williamtown and the surrounds," Lonergan explained. The relocation to the WAC has enabled the company to design a purpose-built facility that could support the company's work with Defence. The relocation has also allowed for closer collaboration and support networks to develop between the various companies supporting both the F-35 and broader Air Force mission at Williamtown. Supporting the F-35 will provide Milskil with myriad opportunities over the coming decades, as the airframe and capability evolves with the operational and strategic requirements of Air Force, enabling the company to expand and evolve with the aircraft. "The future is very bright for Milskil on the back of the F-35 and we look forward to contributing to the program as it develops and matures throughout the life of the aircraft service with the RAAF," Lonergan said. A pretty interesting program that should provide some significant cost savings. The USAF has traditionally overstaffed their maintenance units so it is good to see some leanness coming in. The 388th Fighter Wing Public Affairs has announced on 14 November that after several months, an innovative program in the 388th Fighter Wing is proving it has the potential to deliver combat power more efficiently and may shape how the Air Force determines future requirements to sustain F-35A Lightning II operations. “Our Airmen are learning to really unlock the combat potential designed into the F-35 and this program is going to ‘bring the future faster’ by providing greater operational capability and supporting agile basing initiatives,” said Col. Michael Miles, 388th Maintenance Group commander. Blended Operational Lightning Technician program combines six maintenance-specific Air Force Specialty Codes, essentially job descriptions, into two “tracks.” Currently there are more than 30 Airmen in the BOLT program. “Blended” maintainers in the Air Vehicle track are crew chiefs, fuels and low observable technicians. Airmen in the Mission Systems track focus on avionics, weapons, and egress. Officials project that nearly 30 percent of F-35 sustainment cost in future years will come from unit-level manning. By combining the jobs and cross-training maintainers in more capabilities, there is not only savings in manpower, but also time. Since January, the program has seen several successes. They are providing aircraft at similar rates to a normal F-35A aircraft maintenance unit of the same size, but they are doing it with fewer man-hours. “One of the metrics we use is measuring maintenance man-hours taken to produce one flying hour. On average, we’re using five fewer man-hours to produce one flying hour than a traditional AMU,” Parkhill said. The goal of the program is not to pile more work on the shoulders of a handful of Airmen, Parkhill said, but to maximize the ability of those Airmen so there is less down time, and more productivity. Reducing the size of the maintenance force also allows commanders more combat flexibility for quickly deploying a small number of aircraft to a remote airfield with fewer airmen. “Normally, each aircraft will have several maintainers assigned to it when we deploy. We’ve gotten to the point where we’re going to start doing “small footprint” exercises with as few as one BOLT Airmen per aircraft,” Parkhill said. The BOLT program has been functioning independently alongside the other aircraft maintenance units, but soon they will fully integrate with the 421st AMU and work alongside them to further test and prove the concept. “It’s exciting for all of us to have the opportunity to be a part of this program that has the potential to really shape the future,” Parkhill said. A very poorly sourced and factually inaccurate opinion piece from the Washington Examiner. Despite the pronouncements of the White House, wasteful government spending is endemic and shows no signs of abating anytime soon. The military, which accounts for half of all federal spending, is not immune. While the media like to remind people of the Pentagon spending $435 for a hammer or $640 for a toilet seat, accounts of true billion-dollar boondoggles often go virtually ignored. More expensive and potentially deadlier than a hammer or toilet seat are the myriad problems associated with the F-35 fighter jet program. The latest chapter in the saga of the F-35 boondoggle is a recent crash in South Carolina due to yet another malfunctioning Pratt & Whitney engine. It caused the military to temporarily ground all of the Pentagon’s costliest planes. After a recent fleet-wide inspection, the Pentagon cleared more than 80 percent of the fleet to resume flying, even though questions abound as to why these issues continue to occur with such frequency. F-35 deployment exercises continue unabated, with F-35 Joint Program Office spokesman Joe DellaVedova bizarrely claiming that "Aircraft deployed are ready for combat." Continued research suggests that the F-35’s issues stem from failed contracting and appropriation practices which, for the sake of fairness to taxpayers, should be learned from and significantly reformed. For many years, the Taxpayers Protection Alliance has listed funding for additional F-35s as earmarks not requested by the Department of Defense. Other taxpayer and good government groups have also considered the F-35 to be one of the most egregious examples of pork-barrel projects in the federal budget. They’re right. While recent spending bills included brow-raising line items involving the F-35, such as $1.3 billion for 13 additional aircraft in the last two years, it’s clear that this cronyist project was wasteful from the very start of production. The jet’s development, which has already cost $400 billion, has been specially crafted in a way to spread the government’s money around to special interests. And when policymakers give money to those who are well-connected instead of those who are best suited for the job, they have to be prepared for the chaos and cost overruns that come with it. For example, the engine malfunction that led to the recent F-35 crash was not the first engine problem the jet has had. Throughout the last several years, Pratt & Whitney has had to investigate claims of excessive vibrations and uneven cooling, as well as issues with its combustor, oil seal, and knife-edge seal. Everyone from the FAA to European regulators have gotten involved, and the engines’ problem-ridden past has created significant delays in jet production at a time when demand has reached an all-time high. Thanks to ineffective and ostensibly well-connected contractors like this one, the F-35 has been in development for nearly 17 years and is seven years behind schedule, all while total acquisition costs have surpassed $406 billion — nearly double the initial estimate of $233 billion. Things will only get worse if the status quo continues unabated. An April 2015 Government Accountability Office (GAO) report found that operation and maintenance costs for the most expensive weapon system in history will reach $1 trillion. Federal appropriations and acquisition leaders should wake up and realize that America’s national defense is too critical to design based on political clout rather than strict utility, efficiency, and merit. The failures and problems that cronyism have wrought are bringing us to the brink of a major national security crisis — one that is unacceptable to anyone not living in the D.C. bubble. For these reasons and more, Congress should think of the hardworking American citizens that are footing the bill and begin putting country over politics. The failed status quo has gone on for long enough. Construction has begun on the F135 MRO&U facility in Australia. Australian Defence Industry Minister Steven Ciobo has broken ground on TAE Aerospace’s new Turbine Engine Maintenance Facility (TEMF) in Queensland. Located in Bundamba, south-east Queensland, the latest turbine engine maintenance site will help support in-country sustainment of the Royal Australian Air Force’s (RAAF) F-35 Lightning II joint strike fighter jets. Scheduled to commence operations from July, the TAE Aerospace facility will offer deeper-level maintenance support for the aircraft’s F135 turbine engines. The Australian Defence Industry will serve as a major but not exclusive customer of the new facility. With the opening of the TEMF, the company will support maintenance, repair, overhaul and upgrade (MRO&U) activities for the Pratt & Whitney F135 engines, in addition to supporting existing Australian Defence Force capabilities. Currently, TAE Aerospace holds contracts with the Australian Government to support the engines for the RAAF’s Classic Hornet, Super Hornet and Growler aircraft fleets, in addition to the M1 Abrams tanks used by the Australian Army. The wholly Australian-owned company has more than 245 employees working at different locations across the country, including 182 in Queensland. Furthermore, the new F135 engine MRO&U activities are expected to add a minimum of 15 aerospace technician jobs to the company’s Queensland workforce. The global F-35 Joint Strike Fighter (JSF) programme has collectively been awarded more than A$1.2bn ($866.18m) in production contracts and will help support up to 5,000 job opportunities in Australia by 2023. The government granted approval for the acquisition of 72 units of the F-35A JSFs, which would help replace the RAAF’s existing ageing fleet of 71 F/A-18A/B Classic Hornets.